Pardo Consultants provided full Mechanical Design services for the 300,000 sq. ft. high school facility for the city of Alliance. This project was funded by the Ohio School Facility Commission. This was a complex project that required several systems of design and quality assurance to ensure the performance as design in the existing structures of the building. The existing demolition drawings were done with great detail showing in clarity the equipment to be removed or left alone. 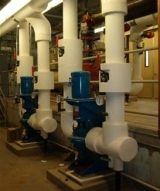 There were two 325 Ton water cooled chillers and three 8,660 MBH input gas fired heating hot water boilers, and primary and secondary chilled water vertical horizontal split case pumps due to existing space limitation. Keeping the space limitations in mind, great attention was given to have a design that would allow the maximum available serviceability for maintenance and proper operation of the systems. There was an extreme amount consideration given to the occupants, their comfort and safety in the design of all the mechanical systems.